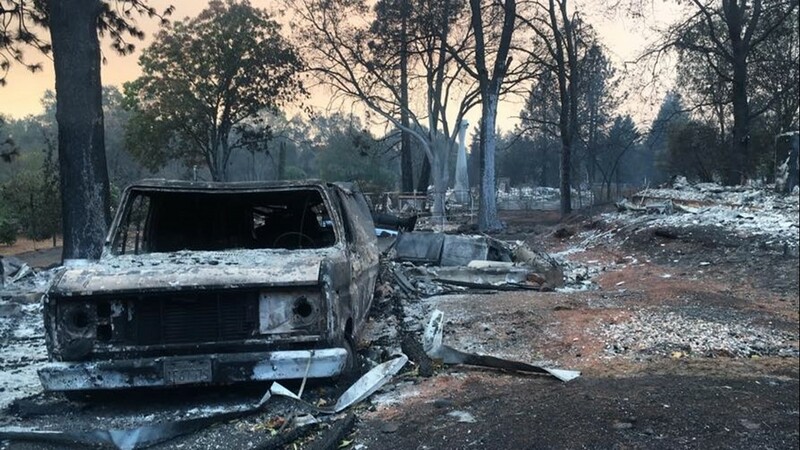 The Butte County sheriff has confirmed 6 additional deaths from the Camp Fire, bringing the death toll to 29. 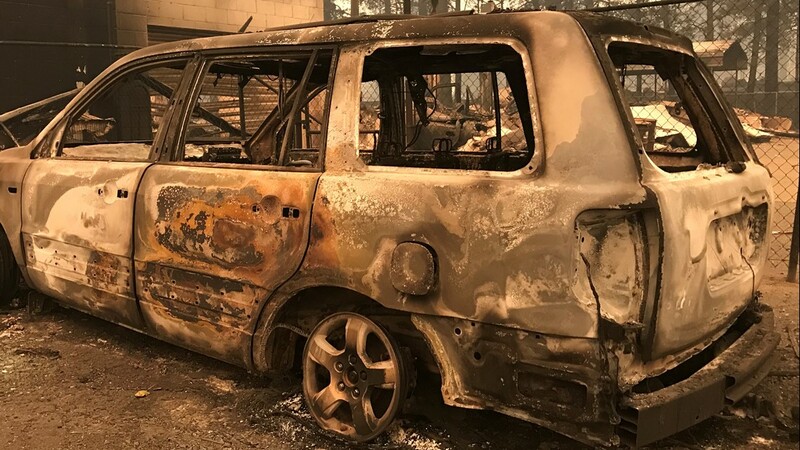 As wildfires continued to rage on both ends of California, officials released another grim statistic: six more dead in a swath of Northern California wiped out by fire, raising the death toll there to 29. It matched California's record for deaths in a single fire. Another 228 remain unaccounted for as crews stepped up the search for bodies and missing people. Two people were killed in a wildfire in Southern California. 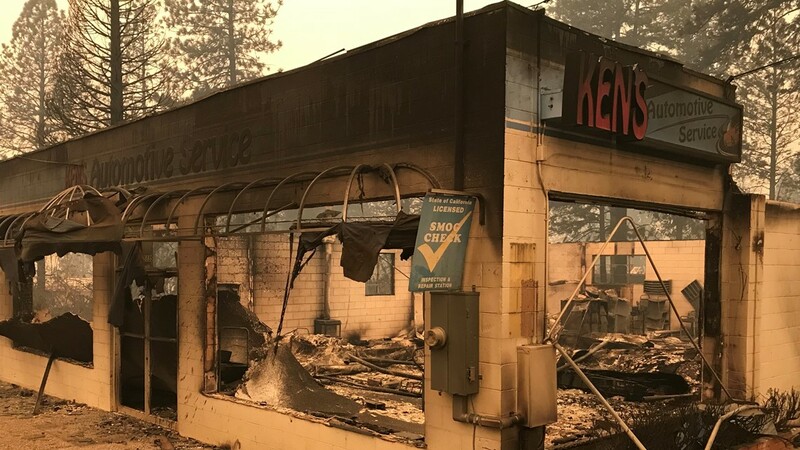 Ten search teams were working in Paradise — a town of 27,000 that was largely incinerated last week — and in surrounding communities in the Sierra Nevada foothills. Authorities called in a DNA lab and teams of anthropologists to help identify victims. 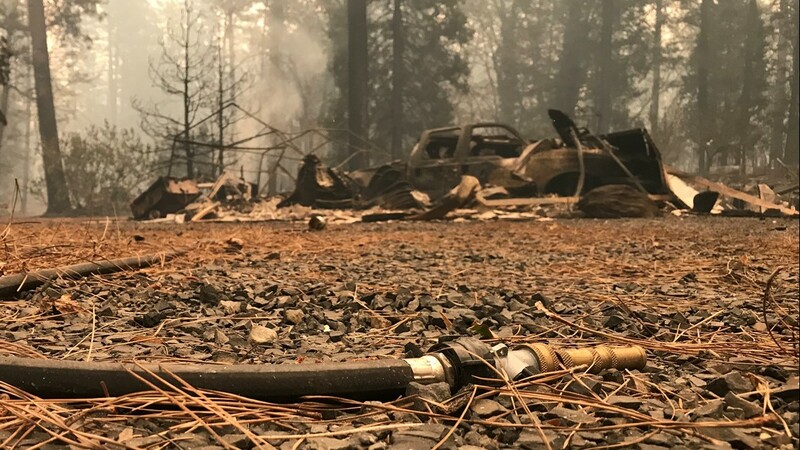 Statewide, 150,000 remained displaced as more than 8,000 fire crews battled wildfires that have scorched 400 square miles (1,040 square kilometers), with out-of-state crews continuing to arrive. Whipping winds and tinder-dry conditions threaten more areas through the rest of the week, fire officials warned. "This is truly a tragedy that all Californians can understand and respond to," Gov. Jerry Brown said at a press briefing. "It's a time to pull together and work through these tragedies." Brown, who has declared a state emergency, said California is requesting aid from the Trump administration. President Donald Trump has blamed "poor" forest management for the fires. Brown said federal and state governments must do more forest management but that climate change is the greater source of the problem. "And those who deny that are definitely contributing to the tragedies that we're now witnessing, and will continue to witness in the coming years," he said. Firefighters battling fire with shovels and bulldozers, flame retardant and hoses expected wind gusts up to 40 mph (64 kph) overnight Sunday. 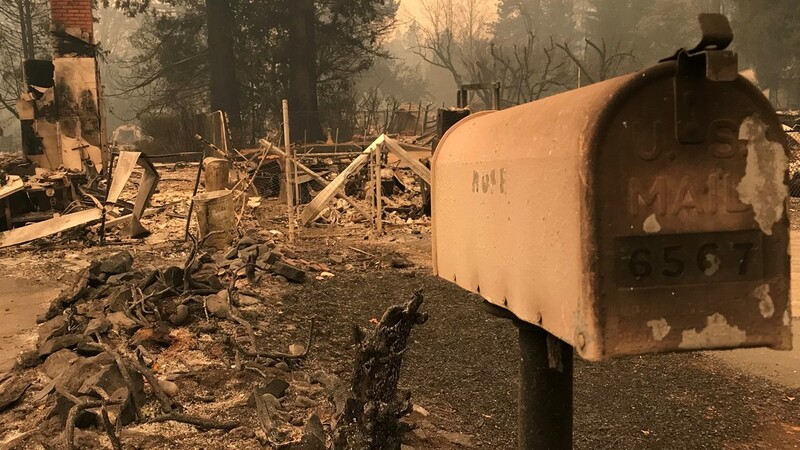 In Northern California, where more than 6,700 buildings have been destroyed, the scope of the devastation was beginning to set in even as the blaze raged on. Butte County Sheriff Kory Honea said the county consulted teams of anthropologists because, in some cases, investigators have been able to recover only bones and bone fragments. In some neighborhoods "it's very difficult to determine whether or not there may be human remains there," Honea said. Public safety officials toured the Paradise area to begin discussing the recovery process. Much of what makes the city function is gone. "Paradise was literally wiped off the map," said Tim Aboudara, a representative for International Association of Fire Fighters. He said at least 36 firefighters lost their own homes, most in the Paradise area. "Anytime you're a firefighter and your town burns down, there's a lot of feelings and a lot of guilt and a lot of concern about both what happened and what the future looks like," he said. "Every story that we've heard coming through has been that way, like 'I wish I could have done more, What's going to happen to our community, Where are my kids going to go to school?'" Others continued the desperate search for friends or relatives, calling evacuation centers, hospitals, police and the coroner's office. 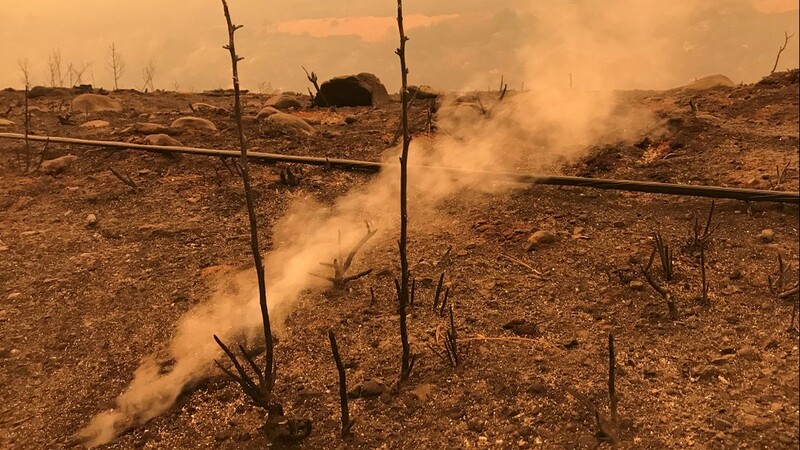 Firefighters made progress against the blaze, holding containment at 25 percent on Sunday, but they were bracing for gusty winds predicted into Monday morning that could spark "explosive fire behavior," California Department of Forestry and Fire Protection spokesman Bill Murphy said. 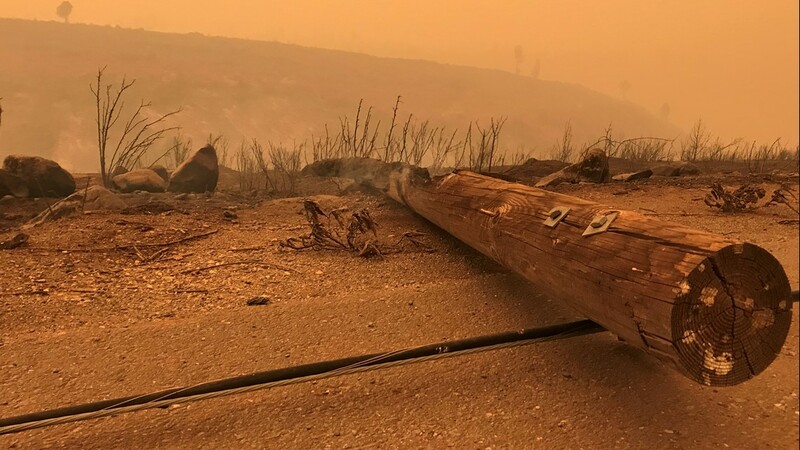 Fire officials are bracing for potentially more fires in Southern California's inland region as high winds and critically dry conditions were expected to persist into next week. "We are really just in the middle of this protracted weather event, this fire siege," Cal Fire Chief Ken Pimlott said. He said officials were moving resources and preparing for "the next set of fires" as winds are expected to pick up. The chief warned that fire conditions will continue until the parched state sees rain. "We are in this for the long haul," Pimlott said. We will update our website with the latest information. For immediate inquiries, call the CAL Fire public information line at (530)538-7826 or the Butte County Public Information line at (530)871-9440. 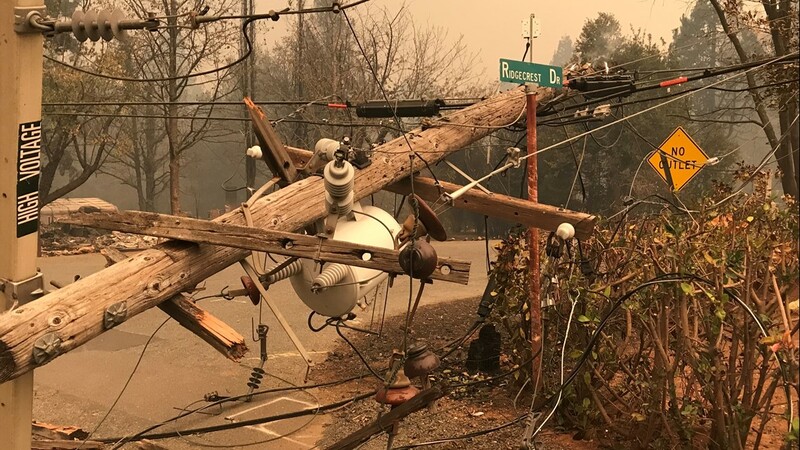 The town of Paradise was one of the communities devastated by the Camp Fire. 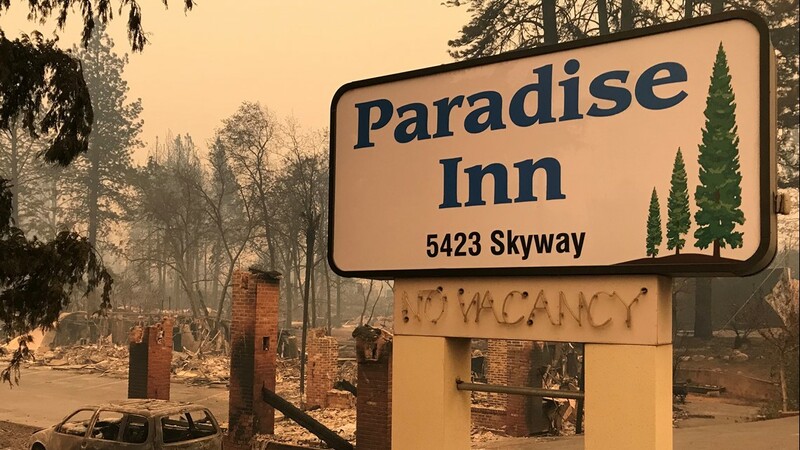 "Paradise...It is with a heavy heart that we reach out to all who have lost so much during the Camp Fire. There is so much devastation. Much of the physical aspect of our Town is gone, but our spirit remains," wrote Gill. "We will be forever changed by this tragedy and it will always be a part of the Town's history. A tragedy like this also changes us as individuals. I hope it makes me a stronger, better, more compassionate person. I am humbled by the heroic stories I am hearing about survival and hope. Although right now we are all heartbroken as we slowly realize the depth of our losses, we are also hopeful for tomorrow. Each step of our recovery will be long and arduous but we are strong and we love our community. We will get through this together and make Paradise better, safer and stronger." Pictured is a downed power line next to a burned car. 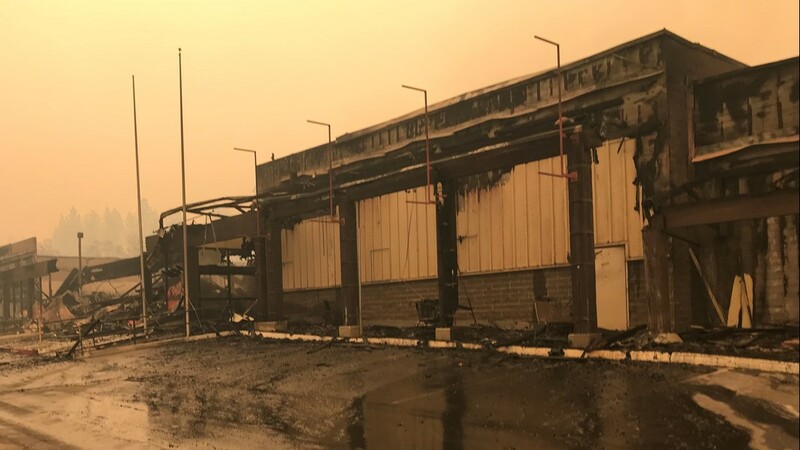 Pictured is what is left standing of a Safeway store in Paradise, CA. 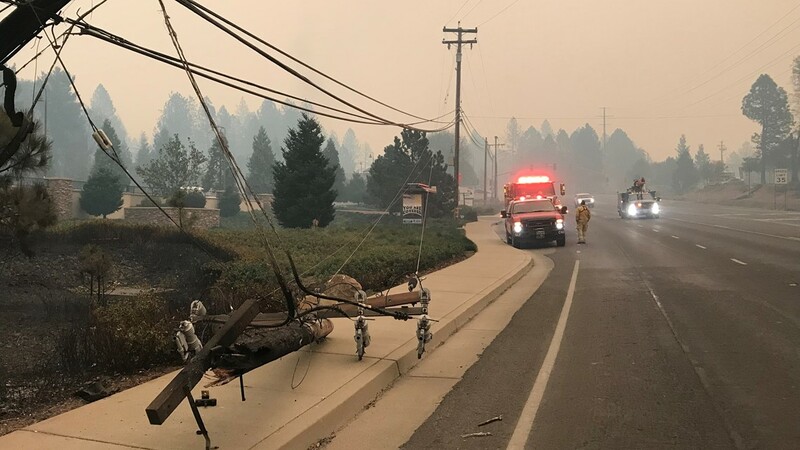 Here is what is left of a home in Paradise, Calif.
A power line went down near on intersection Ridgecrest Drive. A part of the powerline down on Ridgecrest Drive has sparked flames. The remnants of the Paradise Inn. Here is a smoldering home fire. Another burned car in Paradise, Calif. Here is a car collision in Paradise,Calif., headed out of town. Here is a car burned in Paradise, Calif.
Ken's Automotive Service is burned down in Paradise, Calif.
Pictured are first respondents and a downed powerline in Paradise, Calif. Here is a photo of Skyway in Paradise, Calif. Here is another view off of Skyway in Paradise, Calif. Here is another image of Skyway in Paradise, Calif. In a press conference, Sheriff Kory Honea updated the total amount of unaccounted for individuals to 228. This raises the number by more than a hundred from Cal OES Director Mark Ghilarducci’s estimate at 4 p.m. 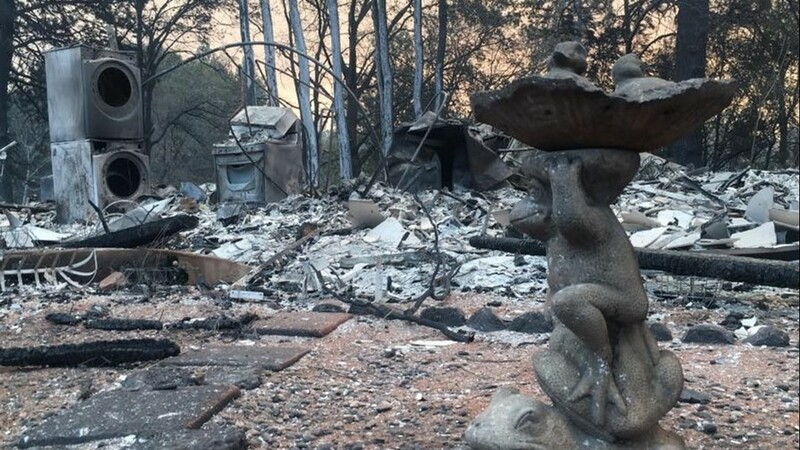 According to the sheriff, his office continues to get calls regarding missing persons due to the Camp Fire. His office has been able to locate 107 people after receiving more than 550 calls regarding missing persons. Other calls are still being investigated, and shelters are being contacted to verify whether some individual unaccounted for are located there. Sheriff Honea also confirmed that an additional 6 deaths from the fire, bringing the death toll to 29. He added that five of these individuals were in homes and one was in vehicle. With the number of deaths, the Camp Fire has matched the deadliest wildfire on record in California history. CAL FIRE spokesman Steve Kaufmann says that the number of destroyed structures is expected increase significantly. “We anticipate that number will increase significantly. I want to stress that there was major fire devastation in that perimeter of the fire,” said Kaufmann. 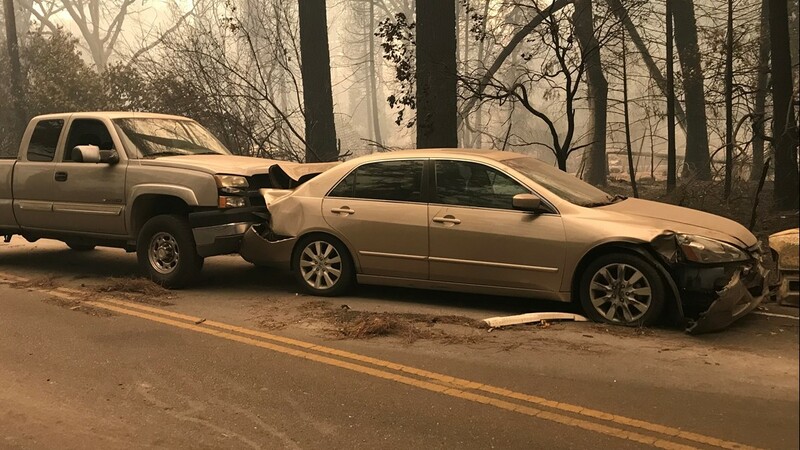 Butte County Sheriff Kory Honea has updated the total amount of fatalities from the Camp Fire to 29. 6 additional fatalities were confirmed by the sheriff at a press conference. 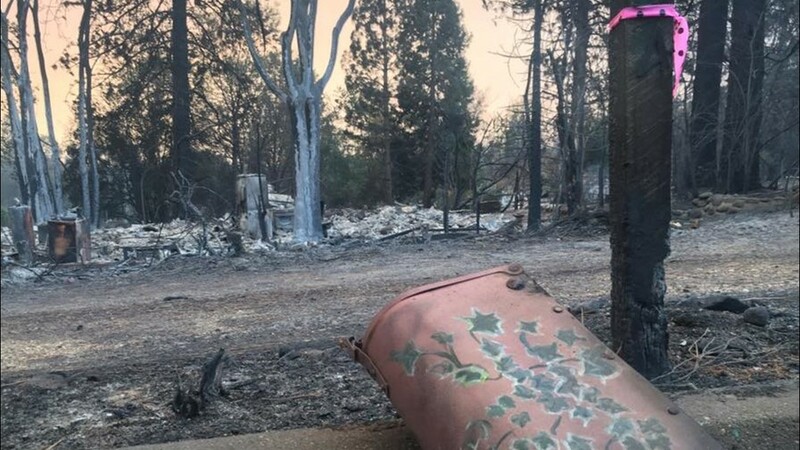 Butte County Sheriff Kory Honea has updated the total amount of unaccounted for individuals in the Camp Fire to 228. Brown says this "new abnormal" will only get worse over the next 10 to 20 years, threatening California's entire way of life. He also noted that the federal government has "more land than the state government." The governor says he would be willing to bring home National Guard troops from the border to help with fires if they're needed. 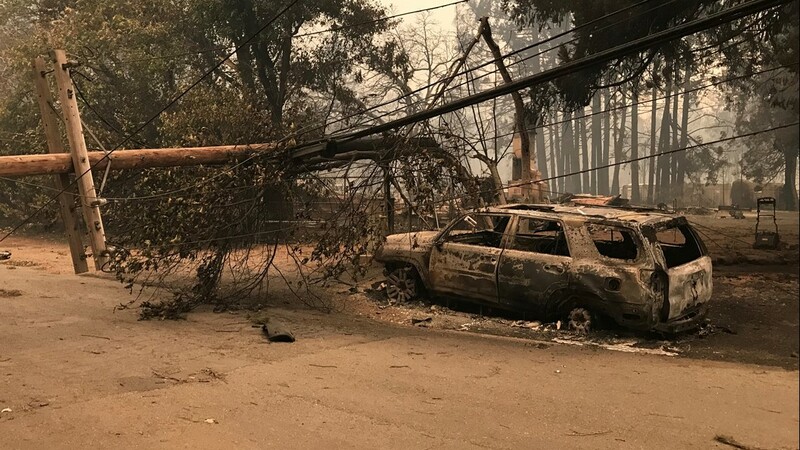 The Camp Fire is now up to 111,000 acres burned, is 25 percent contained, and has resulted in 23 fatalities. Cal Fire Director Ken Pimlott said the Camp Fire in northern California is one of the major fires currently going on in the state. He added that every available firefighting aircraft in the country is available to California and they are using those resources to their fullest extent to battle California's wildfires. "We're in this for the long haul. 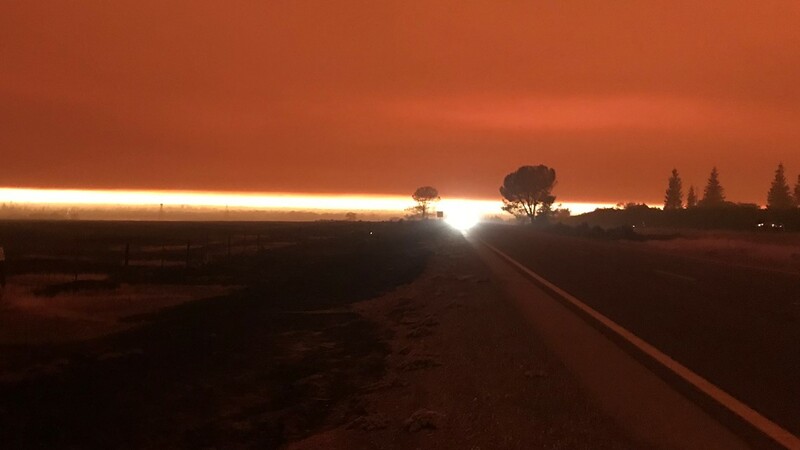 Again, we have firefighters deployed throughout the state working with many, many partners and will continue to do that until these conditions subside," Pimlott said. 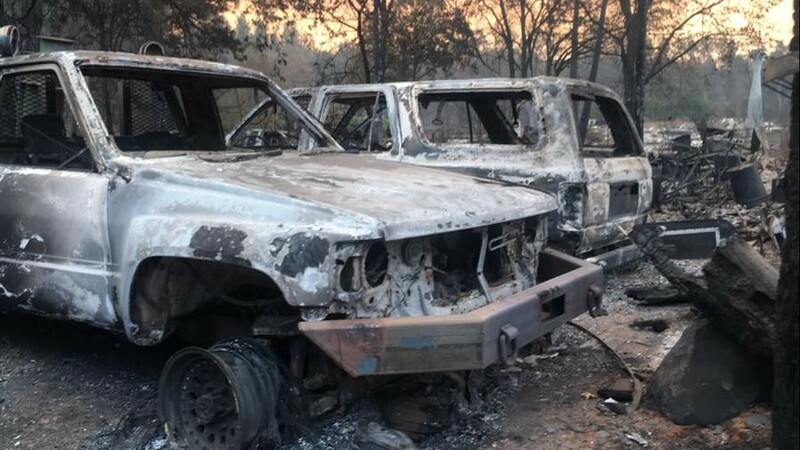 According to California Office of Emergency Services Director Mark Ghilarducci, there are still about 100 people left unaccounted for in Butte County due to the Camp Fire. However, officials are still working to account for all the people impacted by the Camp Fire who may be in places other than shelters. 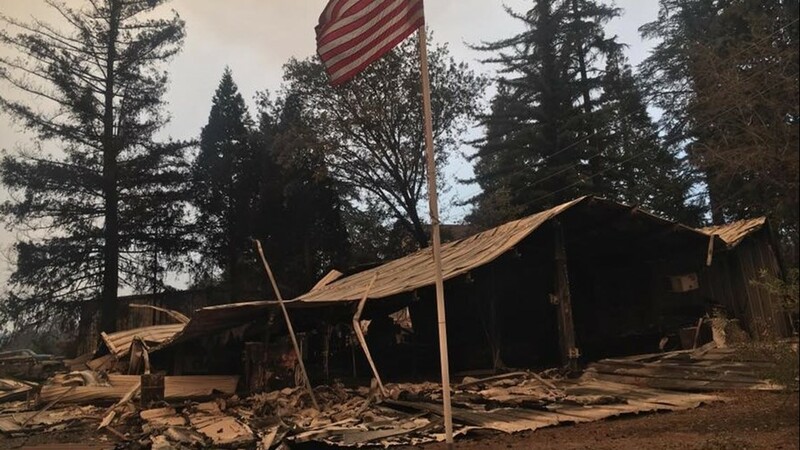 A Northern California businesswoman has taken in a 93-year-old World War II veteran who doesn't know if his home in Paradise is still standing after a deadly wildfire swept through. She says she convinced a reluctant Brundige to follow her home after sheriff's deputies told people to clear out of the parking lot because of the smoke and worsening air quality. Grant's boyfriend, Josh Fox, brought home bags of new clothes for Brundige. Her small dog Axle keeps Brundige company in the recliner they share. Breeding said Walker's husband was at work and called a neighbor to tell his wife to evacuate, but she was on medication and might not have been alert. He assumed she had escaped the inferno and was trying to find her at rescue centers until authorities confirmed her death late Friday. "Yesterday a fireman took him to the house to confirm, she apparently died in bed," Breeding said. "This is a devastating thing, and it's happening to so many people," she added. Anyone 18 years and under will be able to get a free meal from Chico Unified's Nutrition Services Department. Two sites will be opened at Little Chico Creek and Chapman Elementary School on Tuesday and Wednesday. Lunch Only: 11:30 a.m. - 12:30 p.m. Lunch: 11:30 a.m. - 12:30 a.m.
Little Chico Creek is located at 2090 Amanda Way, Chico, CA 95928, and Chapman Elementary School is located at 1071 16th St, Chico, CA 95928. The Butte County Sheriff's Office has activated a Missing Persons Call Center so people can receive information about missing persons from the Camp Fire. Operating hours will be from 8 a.m. to 8 p.m. daily. The sheriff's office suggests making calls to the center even if the friend or family member has already been reported. Detectives can give information on the case's status and other details. The line can also be used to reported a located missing person as well. International Association of Fire Fighters state service representative Tim Aboudara said Sunday that dozens of other firefighters' homes likely also burned. 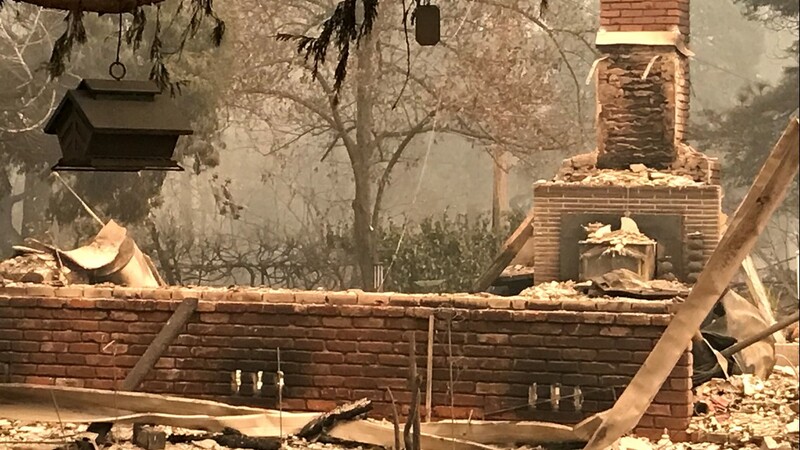 Officials have confirmed that 36 firefighters' homes were among thousands destroyed in Northern California, most when the Sierra Foothills city of Paradise was leveled. Three are confirmed lost in a Southern California blaze south of Simi Valley. Most worked for the state's firefighting agency, but some for the city of Chico and one who commuted to the San Francisco Bay Area. 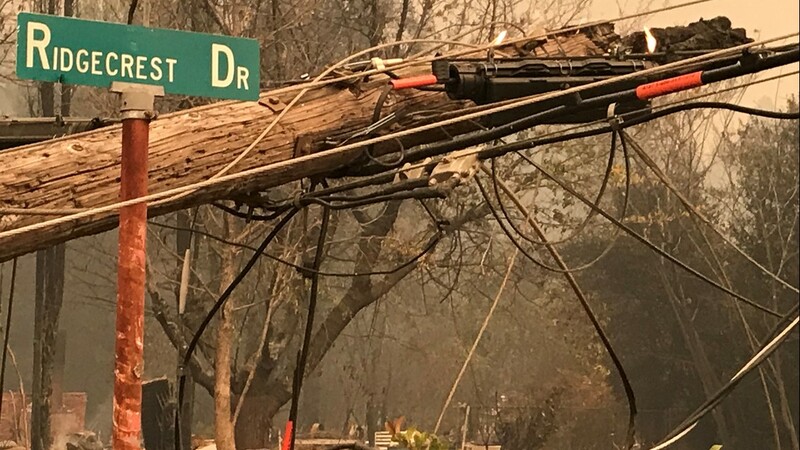 Caltrans has been ensure the first responders in the field are supplied as they combat the Camp Fire. Agencies from around the region and up and down the state have been helping with the wildfire. Honea said investigators can't reach neighborhoods where there is active fire or downed power. While people collect themselves at the evacuation shelter, Ted Land spots some kindness from Jose Uriarte as he hands out food to people at the shelter from his food truck. Hazards surround the area for public safety personnel at the Camp Fire. According to the CAL FIRE Butte Unit, evacuations can't be lifted and no citizens will be able to access to the town until it is safe. Sacramento's air quality index is registering at "very unhealthy" levels. Both the Sacramento Metropolitan Air Quality Management District and the Sacramento County Public Health department are advising residents to take precautions. If you see or smell the smoke from the Camp Fire in Butte County, they suggest minimizing outdoor activity. If you have to go outdoors, it is suggested you get a respiratory mask. Recommendations include staying indoors and keep doors and windows close as much as possible; children, the elderly, and those with respiratory issues should especially be careful to avoid exposure. 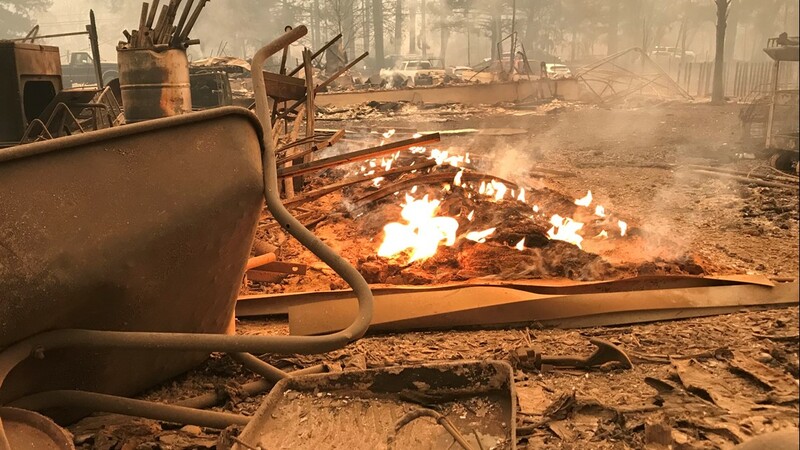 The San Francisco Chronicle reports that the 238-foot (73-meter) Honey Run Covered Bridge near Chico was leveled in the in the fire that ripped through the area late Thursday. All that's left are charred wooden beams, rippled sheet metal and red steel beams protruding from concrete. About 397 square miles (795 square kilometers) of California is burning with the Camp Fire in Northern California's Butte County being the largest. California Gov. Jerry Brown is requesting a "major disaster declaration" from the president for the wildfires burning at both ends of the state. His office said in a statement Sunday that the declaration would bolster ongoing emergency assistance and help residents recover from fires burning in Butte, Los Angeles and Ventura counties. The Camp Fire in Northern California's Butte County has killed 23 people and is the third-deadliest on record in the state. The overall death toll from the outbreak of fires in California stood at 25 Sunday and appeared likely to rise. Cal Fire reports that the Camp Fire has now burned 109,000 acres of land and is 25% contained. The fire is expected to be fully contained by November 30. Clark says crews are at a "pivotal point" and that high winds and dry conditions similar to when the fire started Thursday are expected for the next 24 hours. An anthropology team from California State University at Chico was also assisting, because in some cases "the only remains we are able to find are bones or bone fragments."